Need help paying off student loans? You aren't alone. Learn about how to pay down your debt and get student loan debt forgiveness. Share your student loan advice and read other students tips on how to pay off your student loans. President Obama has taken regulatory measures to make student loan repayments easier. There are some income-based repayment programs that adjust your payments to cap at 10% of discretionary income, and loan forgiveness after 20 years. The loan forgiveness may occur after 10 years for those in public service. The decision to take out student loans is a big one. Before you do, read about some advice from other students. Paying off student loans is so much harder than taking the loan money! At the end of my program upon signing my exit papers, I was hit with a hefty debt. I was astonished by the amount, it was jaw dropping. Looking over the numbers and the interest for two student loans, that if I decided to pay the minimum amount then I will be paying it off well into my 40's, and I'm 22 now. The first way you can pay back your loan successfully is, saving. Saving is the biggest part of paying back student loans. If you don’t save your money, then most likely the longer it’ll take to pay them off! That means no splurging on wants, dining out every other weekend, and spending irresponsibly. The first bill I received from my college student lender spurred me to reevaluate my spending. I became a statistic…an adult living with their parents. My second full-time job became all about saving. I saved money any way that I could. By consolidating my student loans, I was able to bring my interest rates under control. I also set up an auto-draft system with my lender, thereby raising my credit score and further controlling my cash flow. Don’t default on your student loan!!!! The lenders loaned you the money in good faith and trust you to pay it back. 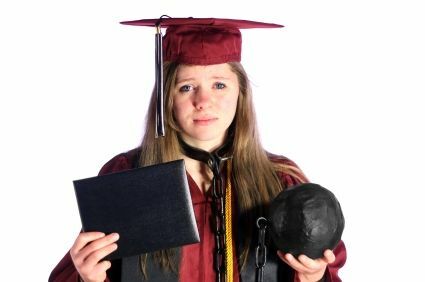 Once you graduate it may take you sometime to find work or you may find a job that does not pay enough for you to pay on your student loans. Simply, call the lender and explain your situation and they will either give you a forbearance or some sort of payment arrangement to help you out so that your loans will not go into default.